The squat is the multi-joint exercise that most gym rats swear by. And what’s more? Even doctors reiterate that it is one of the best exercises which targets a variety of muscle groups throughout your body. The squat has a number of variations, so you won’t have to get bored by doing the same old exercises. You will be amazed at the numerous benefits of the squat and the specific muscles and muscle groups that are impacted when you perform it. So have you decided to include squats into your exercise regime? Not yet? Then here are a few more reasons to convince you to squat, and squat low at that. Squat impacts these four main muscles. Although squats are not regarded as a back exercise, the erector spinal muscle group contracts isometrically and does not shorten and lengthen during the downward movement and upward movement phases of the exercise. Now, how will you find the erector spine group? 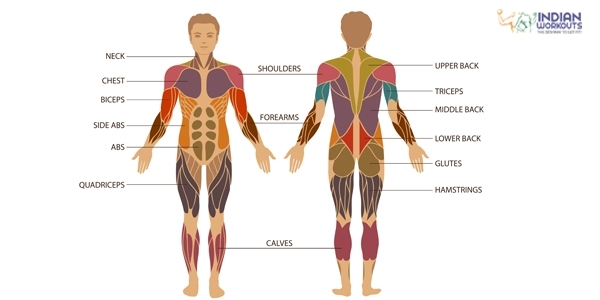 This group of muscles, which includes the iliocostalis, longissimus and spinalis muscles, span the entire length of your back on both sides of your spine, attaching to the various inside structures. These muscles help with lateral, or sideways, spine flexion and also torso rotation ranges of motion. The next muscle group which you can target by doing the squat exercise, is the gluteus maximus muscle. It is the largest of the gluteal muscle groups, which includes both the gluteus medius and gluteus minimus muscles. It helps in the hip extension movement along with the hamstrings on the back of your thigh. The three muscles that constitute the hamstring muscle group are the biceps femoris, semimembranosus, and semitendinosus. They are activated when you perform squats. The hamstrings help the gluteus maximus muscle with hip extension, so they function eccentrically during the downward movement phase and concentrically as you return to the starting position, while you perform the squats. The rectus femoris or the vast intermedium, vastuslateralis and vastusmedialis muscles are together known as the quadriceps muscle group. The quadriceps muscles increase the angle between your lower and upper legs. The quadriceps contract eccentrically while you do the downward movement of the squat and concentrically while doing the upward movement phase. What is the one exercise that stretches the muscles, gets your blood pumping throughout your entire body and also improves your overall health? No prizes for guessing, it is squats! With more nutrients and oxygen reaching the vital organs and muscles of your body, thanks to good circulation; those ugly cellulite marks you are so not in love with can finally go. 2. Digestion troubles? Try Squats! Squats are a great way to enhance elimination. The squat exercise eases the flow of fluids in your body and enablesthe passing of waste through your bowels, so this is one way to stay regular. 3. It is not for building your calf muscles only. Okay, we know that squats are great for building leg muscles, but the good thing is that it promotes muscle growth around your entire body. The exercise creates an anabolic environment that makes the body proliferate hormones that help in the growth of muscle tissue; squats strengthen both the upper and lower body. 4. Squats are great for your back and do not strain your back. Other exercises can put a strain on your knees, ankles, and back, but performing squats do not have this effect. But you have to do it the right way, to prevent injuries. 5. You do not need any fancy equipment or the gym to perform the exercises. Thank God for an exercise that can be performed just about anywhere! So, you can do squats within the four walls of your home and also out in the park. Squats also improve posture and balance. This new found balance and posture help sit, stand and walk tall and straight. It will also strengthen your back muscles and avoid the pains and niggles associated with continuous stooping. Wow, now isn’t that just great? Squats help burn calories too! 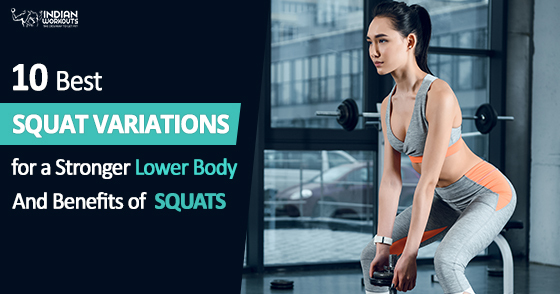 It tones you up and helps in burning calories, so go ahead squat your way to good health and fitness. If you are trying to lose those stubborn extra kilos, squat you must! They’re among the best knee exercises to help strengthen and stretch your knees. It allows more blood to flow around the joints keeping them supple and strong. Squats are not for any specific muscles, but help tone your entire leg! 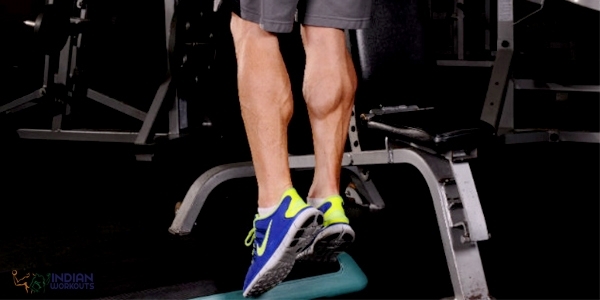 It is the most comprehensive workout to work on the muscles of your legs. If you want to slip into those skinny jeans and look good while wearing them, then squats are the way to go. They firm up your buttocks and give you the silhouette to be proud of. 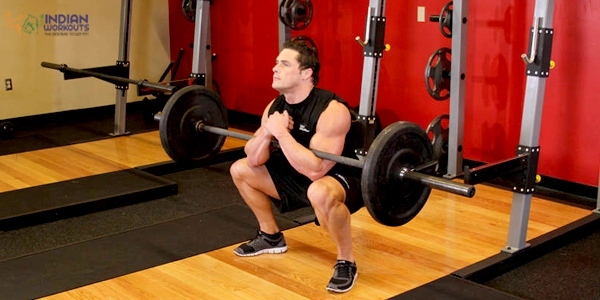 The barbell front squat is a multi-joint exercise that can strengthen your legs in the best possible way. This exercise also helps strengthen the core. Since you load the weight on the front of your body instead of your back, you’re able to activate more of the quads, that too using less weight. This form of the squat is particularly beneficial for those who have had a previous shoulder injury and less range of motion in their shoulders. Stand tall and keep your feet shoulder-width distance and pointed out. Rest a barbell on top of the chest. Secure the bar with fingers with an overhand grip. Keep the triceps parallel to the floor so that you keep the weight of the bar. Take a deep breath and slowly lower the hips until your thighs are parallel to the floor, keep your weight stationary. Pause when you reach the right height, squat and then bring hips back to the starting position. Split squats are not paid enough attention to, but area great variation as they help alleviate right-to-left side imbalances, increase stability and coordination, and can even help with two-leg version. This exercise is tough to look at, so try and master it first before you think of increasing the repetitions. 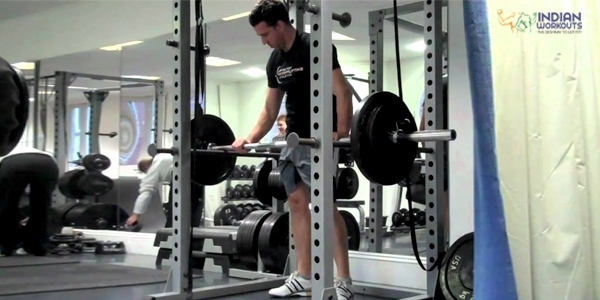 Place a bench or low box right behind you in a squat rack. Place a relatively light barbell across your upper traps as you normally place for squatting, and unrack the bar. Lift one foot up behind you and place it firmly on the bench with care. Stand tall and straight with your chest out, back slightly arched, and back leg bent around 90 degrees. Bend your front leg and then lower yourself down toward the floor as if you are sitting down on a stool. When your thigh is parallel to the floor, press through your heel and return to the standing position. Overhead squats are one of the most technically demanding movements in weight training. They impact mobility, squat depth, back strength, and stability. 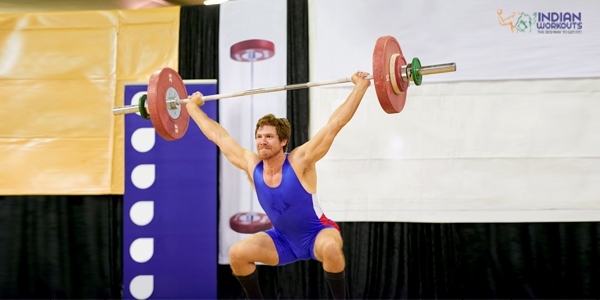 Mastering the overhead squat is really hard, so giving it your all is important. Pull your hips back and keep your weight on your heels. Pull the bar back in a way that you keep the weight directly over your heels. Do not let the bar move forward or behind at any point of the movement. Ensure that your hips reach a point below the top of your knee (below parallel). Keep your weight on your heels and stand to full extension. Squat down slowly and then push up and slightly back on the bar. Keep your torso erect and then let your hips go backward a bit. When you stand up, keep pushing up and back until you are able to stand erect. Front squat is an exercise that keeps the bar in front you instead of on your back. This works on the quadriceps harder than the hamstrings and requires core strength and also keeps an upright position compared to the back squat. Grasp hold of the bar closed in an overhand grip and keep it slightly wider than shoulder-width. Place the bar evenly on top of your front deltoids and also your collarbone. Keeping a relaxed open palm and 3 fingers under the bar, remove your thumb and pinky finger from under the bar. Take a step or two backward, while taking a step or two backward. Inhale and hold that breath towards the bottom to keep your abdomen tight. Flex your hips and knees slowly. Drive your knees outwards as you squat. Continue to squeeze the elbows up and inwards and focus on keeping your elbows up at the bottom of the lift. Once you’ve reached the parallel, drive upwards keeping your heels on the floor and knees aligned with feet. When you are halfway up, exhale and power through with the glutes and your core tight and braced in. The Zercher squat is one of the more challenging exercises that helps develop a greater core, back, and also gain some leg strength, and is therefore one exercise that can definitely be added into your training regimen at some point. Set up the bar on a rack. Reach your forearms out in front of your body, keep your elbows bent and place the bar on top of upper forearms. Move away from the rack and position your legs keeping a shoulder width stance with your toes slightly pointed out. Lower the bar while bending the knees and maintain a straight posture with your head up. Continue to go down until the angle between the upper leg and the calves is less than 90-degrees. Come back to the starting position. The Anderson Squat, also known as the pin squats, is a quad exercise that includes an overall leg/glute exercise as well. This modified version of a normal squat was first used by legendary weightlifter Paul Anderson. Keep the safety support height according to the squat depth you want. Keep a loaded weight bar on the safety supports themselves. Get into a squat position under the bar and stand up, completing the concentric portion of the rep.
Then lower the weight back down and place onto the supports to complete the eccentric part of the rep.
Now, do the next repetition. The pistol squat or the single-leg squat, is an effective exercise that combines strength, flexibility, and grace. This exercise needs proper execution and mastering each element. Begin with your arms extended out in front of your body. Balance your body on one leg with the opposite legextended straight in front as high as possible. Squat down low as far as possible and keep the elevated leg off the floor. Keep your straight and keep the supporting knee pointed in the same direction as your supporting foot. Lift your body back up to original position until your supporting leg is straight. Repeat and switch to the other leg. Squatting is a natural movement, and the body weight squat is one of the best calisthenics exercise. Everyone should try to squat and go through a full range of motion effortlessly minus the pain. Here is how you can get this right. Stand with your feet shoulder width apart and turn your toes out slightly. Sit back with your hips extended and bring your body as far down as possible without rounding your lower back. Push your knees out as you go down and keep your chest up. Jump squats are the type of exercise that works the quads and calves, which help tone your body as well. Jump squats are an explosive way to work on your leg muscles and can be made an integral part of your exercise regime. Interlace your fingers on the back of your head and pull your elbows back so that they are in proper alignment with your body. Stand straight with your feet shoulder-width apart and get into a squat position. Tighten the core and explosively push hips upward, jumping as high as you can. Ensure that you drive through your heels and not your toes. When you land, squat down and jump again. When you perform asquat, taking a stance wider than shoulder-width has been shown to provide distinct advantages. It works a greater number of muscles. A wide stance impacts your glutes, your overall strength, and also the back and knee. Place a barbell behind your head and below your neck. Get hold of a barbell with wide arms and palms facing forward. Stand and keep your feet very wide apart. Keep your back straight as you inhale and bend your legs to lower your upper body down into a squat. Do stop when your upper legs go slightly beyond being parallel to the floor. Repeat again and then complete a set.